It’s been a whirlwind of a week for those following the orange and blue. First, we said goodbye to Curtis Granderson, who was shipped off to the Los Angeles Dodgers in exchange for right-handed reliever Jacob Rhame. Granderson was not only a key component in the success this team has found over the last few seasons, but also one of the highest character guys to ever suit up for the Mets. We also said farewell to Rene Rivera, who was claimed off waivers by the Chicago Cubs. Like Granderson, Rivera will now get a chance to play in the postseason, a remarkable change of pace for a player who essentially revived his career as a member of the Mets. Nevertheless, as we continue to say goodbye to some of the veterans on this ballclub, the Mets still had a game to play last night. Hosting the Arizona Diamondbacks in the first game of a four-game set, the Amazins dropped the effort by a score of 3-2 in 10 innings. At 54-69, the Mets staggered back to a whopping 20.5 games behind the division leading Nationals and 13 games out of the second Wild Card spot. Here’s what you need to know from Monday’s matchup. 2017 has seemingly been a lost year for Robert Gsellman. His recent efforts have been mired in struggles which makes his performance tonight all the more encouraging. Against a solid Diamondbacks team that could very well be playoff bound, Gsellman posted a quality start effort. The right-hander surrendered one earned run in 6.1 innings, while striking out three. If Gsellman can pitch well throughout the remainder of the season, he has the chance to carve at a role on this pitching staff for what should be a competitive 2018. Like any player that spends a significant time on the disabled list, you can expect that their regular season numbers will not reflect their true value. Yoenis Cespedes has missed 46 of the Mets’ 123 games in 2017 and, at this point, we’re just looking for signs of life. Last night was a good reminder of how important he is to the ball club, notching three hits singles in five at-bats. Cespedes also drove in the game-tying run after knocking a bases loaded single to left. It very well could have been the go-ahead run, but David Peralta made a great throw to plate, nailing Asdrubal Cabrera on play that was challenged and upheld. Cespedes has already committing to switching up his offseason training program and becoming more flexible, so all we can hope for is for him to spend the next six weeks grinding out at-bats, notching hits, and continuing to make adjustments and get better. Yes, Dom Smith and Amed Rosario are on the Mets, so the future is now. But, I think we are guilty of the same mistake. While Rosario and Smith will hopefully be All-Stars one day, the next franchise player has been right under our noses the whole time. I have said this many times in prior recaps, but it’s amazing that Michael Conforto almost didn’t end up on the Opening Day roster. He has performed well beyond expectations and reaffirmed his status as a key building block in this organization’s future. Things looked pretty grim after he struggled so mightily in 2016, but he’s managed to find success as both a leadoff hitter and a middle of the order bat in 2017. Conforto notched his 27th home run tonight after a solo blast in the tenth. When you consider that he’s launched 27 bombs and driven in 66 runs in only 367 at-bats, it really makes you wonder what he has the potential to do over the course of a typical 600 at-bat season. With all that being said, he’s managed to transform himself into a remarkable defender, giving the Mets the opportunity to bring in another corner outfielder to bolster their lineup in the offseason. It’s very early to say, but Michael Conforto could very well succeed David Wright as the face of this franchise. As I mentioned right above this, with Rosario and Smith in the majors, the future is now. The problem is that the two young bucks have struggled out of the gate. Rosario and Smith both notched singles last night, raising their batting averages to .243 and .158 respectively. Some may panic, seeing these alarmingly low numbers, but the important thing is for these two guys to play every day. If the Mets want to compete in 2018, then Rosario and Smith need to get comfortable in the majors more than anything. Getting used to the big league stage and preparing for 2018 is the number one priority. Following a solid effort from their starter tonight, the Mets’ bullpen put forth a great effort to keep the game close and eventually tied. The problem is that they were just one inning too late to pull out a victory. Jerry Blevins, Paul Sewald, and A.J. Ramos combined for 2.2 scoreless frames with four strikeouts, sending the game tied into the 10th. Unfortunately, Erik Goeddel surrendered a go-ahead two-run homer to A.J. Pollock. It’s even more unfortunately, because Conforto homered to lead off the bottom of the inning, which presumably could have been a walkoff had the game remained tied. Putting aside Goeddel’s mistake, it’s great to see Blevins, Sewald, and Ramos pitch well as they all have the chance to be key pieces in the pen next season. 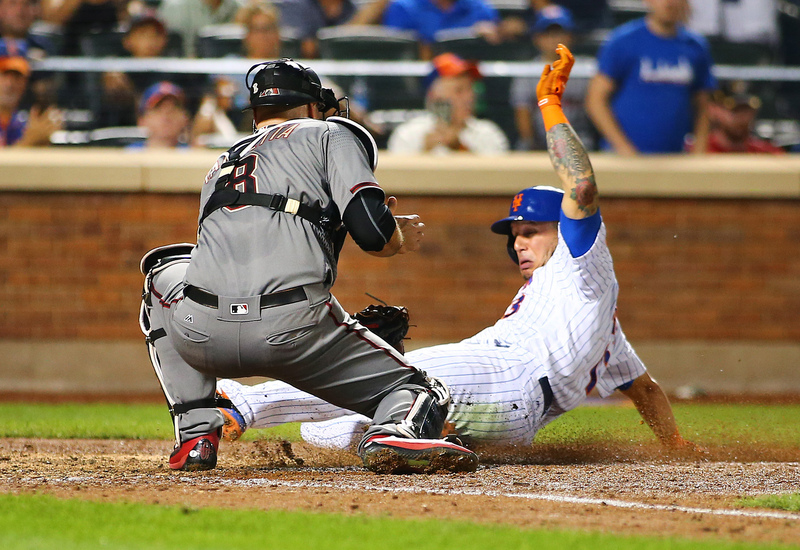 The Mets will play the second game of a four-game set against the Diamondbacks on Tuesday. Patrick Corbin faces off against the recently recalled Tommy Milone in a battle of left-handed starters at Citi Field at 7:10 p.m.